Naidu will also submit a memorandum to President Ram Nath Kovind on Tuesday to push his demand. Last time, the TDP chief had observed a fast in Vijayawada on his birthday on April 20, 2018. In March last year, the TDP had pulled out of NDA over Centre's refusal to grant special status to Andhra Pradesh. 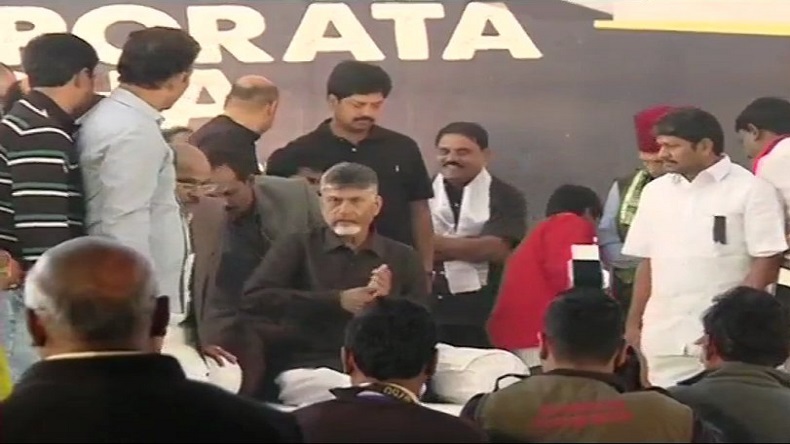 Andhra Pradesh Chief Minister and Telugu Desam Party chief N Chandrababu Naidu on Monday began his day-long hunger strike in Delhi against the Modi government over the issue of special status to Andhra Pradesh. Earlier this morning, Naidu paid tribute to Mahatma Gandhi at Rajghat ahead of the beginning of his day-long fast. Naidu is sitting on a hunger strike along with his ministers, MPs, MLCs and MLAs at Andhra Bhawan. The TDP chief had arrived in the national capital on Sunday evening. Naidu has accused Prime Minister Narendra Modi and the Bharatiya Janata Party of backstabbing the people of Andhra Pradesh for not granting special status to the state after Telangana was bifurcated. Naidu’s fast is expected to turn to be a grand show of opposition parties as Lok Sabha 2019 elections just a few months away. The TDP has claimed that it has the support of 21 opposition parties. Former Jammu and Kashmir chief minister Farooq Abdullah and Delhi Chief Minister Arvind Kejriwal will also meet Chandrababu Naidu at Andhra Bhavan.